June primary voters weighed in on what might ordinarily be considered a daunting number of issues: nine citywide measures, and one state measure. The local measures, which this guide covers, range in sexiness from a new stadium to how the city handles purchasing and contracting. It’s a lot to learn, a lot to process, a lot to decide. What it is: Measure A is a proposal from the San Diego Association of Governments that would levy a half-cent sales tax to fund transportation and infrastructure projects throughout the county. The measure would raise about $18.2 billion over the next 40 years. Roughly 42 percent of that would go to public transit projects; 14 percent to highway improvements; 30 percent to individual cities to spend on local infrastructure; 11 percent to open space preservation and 3 percent to walking and biking projects. The measure would legally bind SANDAG to complete some of the projects within 15 years, including the Purple Trolley line from San Ysidro to Kearney Mesa and a new Coaster station at the Del Mar Fairgrounds. The backstory: The money earned from the tax would pay for some of the $204 billion worth of projects SANDAG has laid out in its regional transportation plan. Some of the projects in that plan are being funded by a tax that voters approved years ago, Transnet. This measure is separate and would fund separate projects. It would also help fund a commitment San Diego made to protect endangered species on preserved lands – an agreement it’s never really figured out how to pay for. Separate measures floated by the agency earlier this year pitted public transit projects against local infrastructure. In July, SANDAG’s board finally approved a combination of the two to put on the ballot. The plan has support from Chula Vista Mayor Mary Salas, Councilman Todd Gloria and the San Diego Chamber of Commerce. Mayor Kevin Faulconer, North County leaders like Poway Mayor Steve Vaus, and a coalition of labor and environmentalists oppose it. A YES vote would: support raising sales tax by half a cent for the next few decades for transportation and infrastructure. A NO vote would: not raise taxes for these projects. 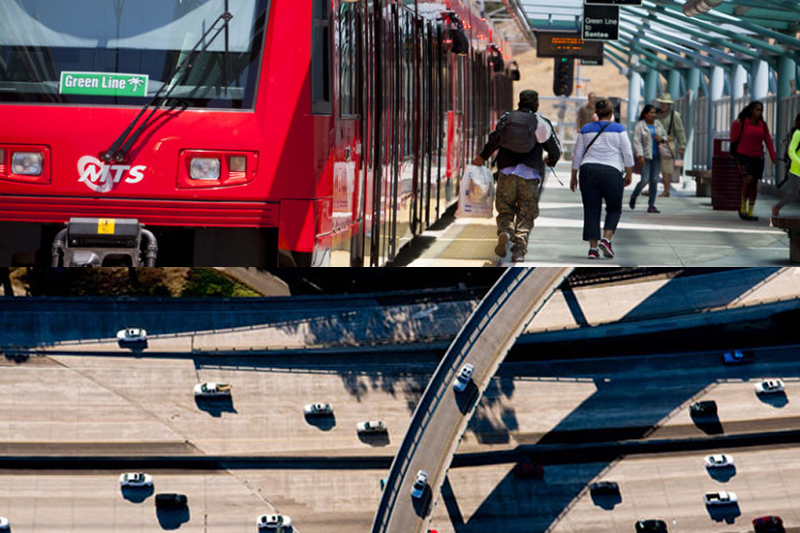 The transportation projects that would be funded are still part of SANDAG’s long-term plan and the agency is still expected to try to move forward with them, but how they’re funded would be up in the air. What it is: Measure B is a countywide measure put forth by the developer Accretive Investments. 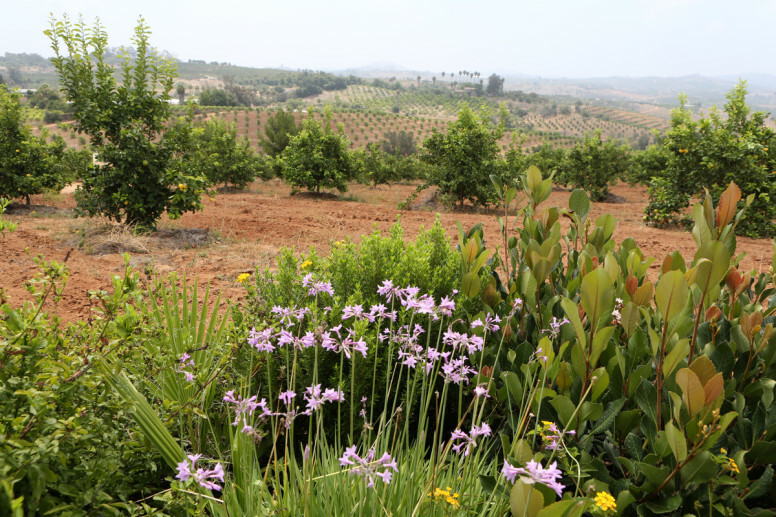 It would approve Lilac Hills Ranch, a 1,700-home development near Valley Center. The backstory: Lilac Hills Ranch has been trying to work through the traditional county permitting process for nearly a decade. The development required special permission because it would add more than 1,700 homes in a rural area that currently only allows for 110. It’s been vehemently opposed by a group of residents, and back in 2009, the county outright denied the project’s application. A new director re-organized the planning department at the county gave the project another chance. It narrowly gained a Planning Commission recommendation, dependent on certain changes to the project being made. Then, Lilac Hills Ranch hit two roadblocks late last year. The first was that a state watchdog told Supervisor Bill Horn, who was expected to vote in favor of the project, to recuse himself from the vote on the project. Horn owns nearby property whose value would increase if the project were approved. The other was a decision by the California Supreme Court on another large, sprawling development in the Los Angeles area that left all similar projects statewide uncertain as to how they should measure and disclose their potential greenhouse gas emissions. So the developers decided to go to the ballot to circumvent these obstacles. But they left some of the conditions the county had imposed out of the plan. Before the measure was placed on the ballot, county staff wrote a report detailing these differences between the plan. The county wanted developers to fund a new school to accommodate new residents, improve roads to bring them up to safety standards and fund a new fire station. The ballot measure doesn’t obligate Accretive to do any of those things, though it hasseparately said it will help the Bonsall school district build a school and would provide some additional money to the county to help fund road improvements – though the county has said it’s unclear whether these separate agreements are legally binding or enough to address the issues. A NO vote would: reject the Lilac Hills Ranch development plan. 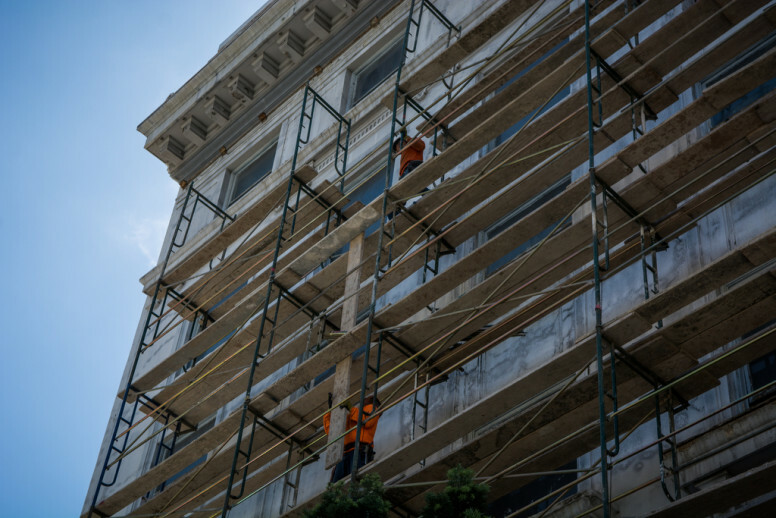 The developer hasn’t stopped the traditional county permitting process, so it’s unclear what their game plan will be if the voters don’t approve the measure. A rendering of the Chargers’ vision for a downtown stadium and convention center facility. What it is: A convadium! It would raise the hotel-room tax in the city of San Diego from effectively 12.5 percent to 16.5 percent to finance construction of a joint stadium and convention center in San Diego’s East Village. The measure provides the permit for the facility, outlines only the broad limits of how tall and wide it can be, allows it to put up giant, digital billboards and lays the joint powers authority that would own and manage it and says it would be used by a professional football team, which would have responsibility to maintain the football parts of it. That team, obviously, is the Chargers – but it’s illegal to put up a measure that one company specifically will benefit from, so it is left vague. One other point: The city’s hotel-room tax is actually 10.5 percent right now. Hotels collect 2 percent on top of that to fund what is called the Tourism Marketing District. This is why we say the city’s effective hotel-room tax is 12.5 percent. Measure C replaces the Tourism Marketing District with just 1 percent of the collections and the promise it could get more if there’s money left over after other debt and obligations are funded. The backstory: In January, Chargers President Dean Spanos worked to persuade other NFL team owners to let him move the team to a new stadium in Carson. The other owners, however, chose a different project in Inglewood, where the Rams are now overseeing construction of a large development and stadium. The owners gave the Chargers two things: the right to join the Rams in that facility and the promise of $100 million more to help with construction of a new stadium in San Diego. Determined to put something together in time for the November ballot, the Chargers raced to arrange the team’s ideal plan: downtown and fully funded with no chance of the revenue to pay for it not materializing. It was an extraordinarily hurried process and the Chargers did not secure any support for it before the team unveiled it. Then, with the support of some labor unions and local members of Congress, the team launched a signature-gathering effort that successfully put it on the ballot as Measure C.
The Chargers say the measure unquestionably protects the city’s general fund from costs associated with the construction and maintenance of the convadium. The hotel tax will be sufficient, the team says, to fund construction and maintenance and unforeseen costs. Opponents dispute that and also say there are related infrastructure, parking and traffic costs that might fall on the city and the measure does not do anything to retire existing city debt on Qualcomm Stadium. The city pays an average of $4.9 million a year on that debt, through 2026. A YES vote would: approve the plan, but a few caveats: It requires two-thirds support. If more than two-thirds of voters choose yes, then the city and Chargers would begin negotiations to set up the joint powers authority that would oversee construction of the facility. They would design the facility (its design, besides the broad limits, is not determined). If for some reason the facility is not built, the hotel tax would retreat to a 3 percent increase. There’s a chance the measure could not get two-thirds of voter support. If it only gets 50 percent, the Chargers have some hope it could be implemented after a recent court ruling indicated that taxes raised by ballot initiative only need support from a simple majority of voters. Some Chargers supporters argue it is important to show the team support so that even if the measure fails to get two-thirds, the team will see the support it did have and keep negotiating. A NO vote would: reject it. It would force the Chargers to come up with a different stadium plan or follow through on the threat to move to Inglewood. A broad coalition of hotel-industry leaders, politicians, activists in Barrio Logan, construction contractors hostile to labor unions and others argue the tax hike is too much, it’s a bad place for a stadium and too many questions are left unanswered or can’t be negotiated because the vote will be binding on many points. What it is: Called the Citizens’ Plan by supporters, this measure would raise the city’s official hotel-room tax from 10.5 percent now to 15.5 percent. For smaller lodging businesses, the tax would be 14 percent. It would eliminate the Tourism Marketing District 2 percent levy that is currently collected on top of the 10.5 percent city tax and replace it with an option for hotels to voluntarily contribute to tourism marketing and deduct up to 2 percent from their payments to the city if they do. It would also allow them to deduct up to 2 percent more if they contribute to construction of a convention center. In short, it’s a guarantee the city will collect an additional 1 percent from hotel-room visitors – money that will go directly into the city’s general fund, which can be used for parks, police, fire and other needs. It prohibits the city from spending money to expand the existing Convention Center. That would have to be overturned by another vote of the people (a vote would likely be needed regardless to authorize a tax hike). The Port could expand the Convention Center with a different financing mechanism. 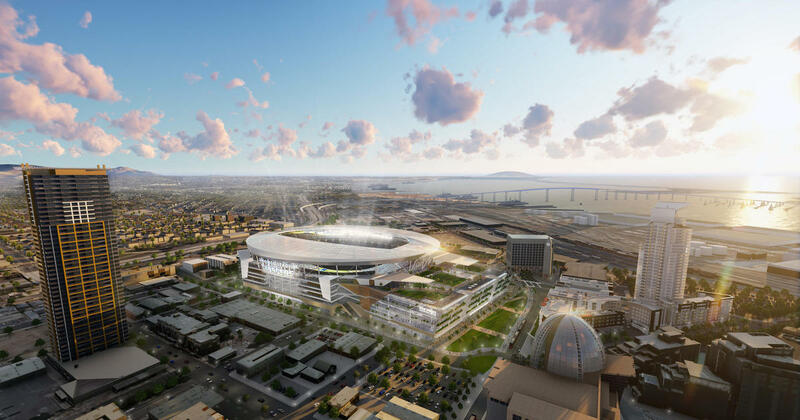 It provides for help expediting the permitting of a stadium downtown and in Mission Valley, and the stadium could be combined with the separate convention center expansion it does allow, though the funding would have to be kept separate somehow. If the Chargers leave the team’s current stadium, this measure authorizes the city to sell the land under Qualcomm Stadium to either San Diego State University, UC San Diego, a local community college, the San Diego River Conservancy or any combination of them. If the city sells that much land, it is required to get a vote; this serves as that vote. The backstory: This measure was put together by attorney Cory Briggs, former City Councilwoman Donna Frye, their allies and JMI Realty, which provided crucial funding, as did former Padres owner John Moores. It was designed as a sort of grand compromise with hotel owners often at odds with Briggs as a way to provide a route to a new convention center off the waterfront, a way to preserve tourism marketing funds that were under legal threat and to set in motion plans for the land under Qualcomm Stadium that many people covet if the Chargers were to leave. Hotel owners other than JMI did not end up supporting the measure. 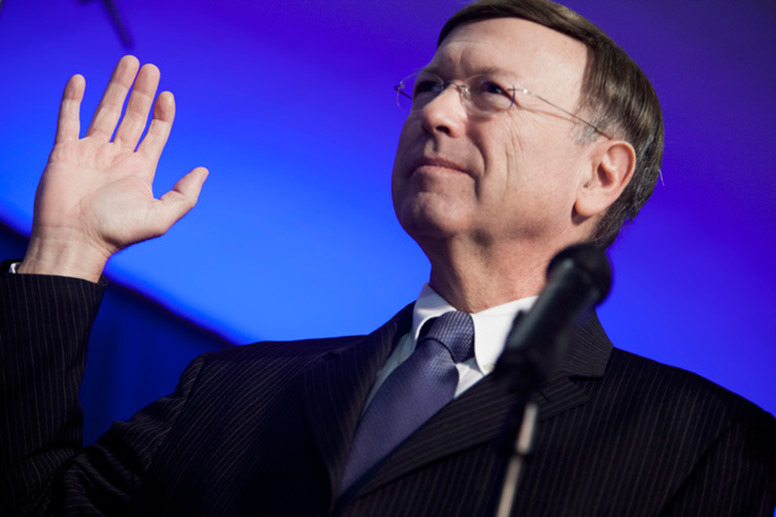 San Diego State’s president expressed support for the idea of expanding into the Mission Valley area. A YES vote would: approve the measure. Briggs and his lawyer, elections attorney Jim Sutton, argue it requires only a simple majority to be implemented. San Diego City Attorney Jan Goldsmith says it would need two-thirds support. If it gets a simple majority, there will likely be a court battle. A NO vote would: reject the measure. Bob Filner and former chief of staff Lee Burdick. What it is: This measure would make it easier to remove and replace elected city officials who’ve committed crimes or other wrongdoing. Measure E would require the mayor, city attorney and City Council members to forfeit their job outright if they are convicted of a felony, found civilly liable for fraud or declared incapacitated by a court. The measure would also create a new process to remove elected city officials convicted of certain misdemeanors. A court declaration that an elected official is neglecting his or her duties could also merit removal proceedings. Under those circumstances, three-fourths of the City Council could vote to hold a special removal election, then a majority of voters would need to approve the removal of the public official. San Diego would become the first city in California to create such a Council-initiated special removal election, according to the city attorney’s office. Voter-led recalls would remain intact. The measure would also require city attorney candidates to be licensed to practice law in California for at least 10 years. The backstory: San Diego Mayor Bob Filner resigned in late August 2013 amid an onslaught of sexual harassment allegations. The City Charter only allows for the mayor to be removed through a recall election, which is hard to trigger, so officials had to broker a deal to get him to resign. 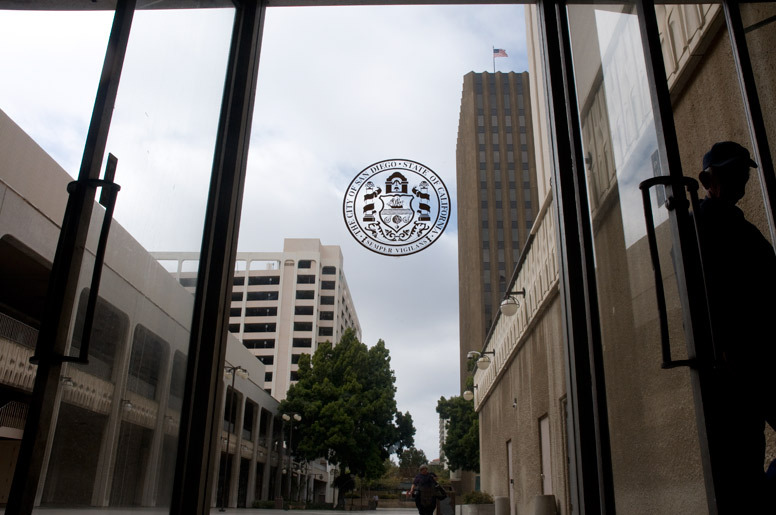 A charter review committee, with help from the city attorney’s office, drafted this measure in response to the County Grand Jury’s recommendation to expand removal options for elected city officials. A YES vote would: Offer new avenues for removal of elected city officials, and boost the requirements for city attorney candidates. A NO vote would: Keep the status quo, which requires death, resignation, loss of voter eligibility or a recall to force an official out before the end of his or her term. 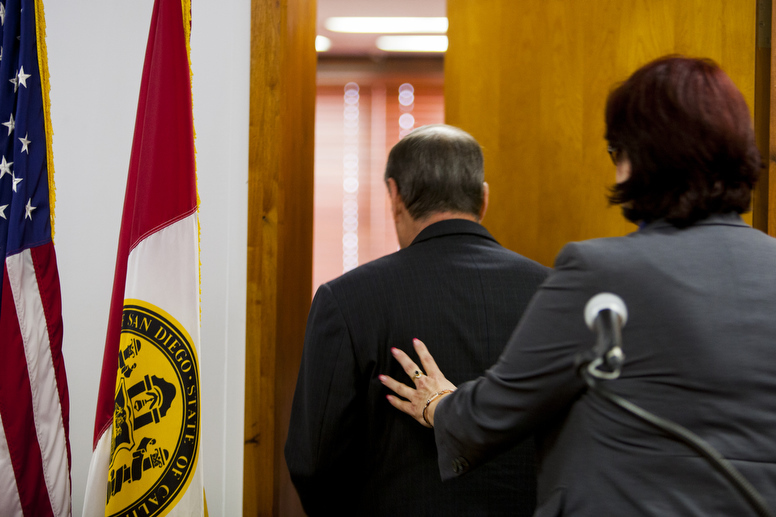 What it is: a measure to increase job security for deputy city attorneys. “Deputy city attorney” is a fancy name for lawyers in the San Diego city attorney’s office. They prosecute misdemeanors, represent the city in lawsuits and give legal advice to other city agencies, as well as to the City Council and the mayor. Right now, a deputy city attorney can be fired without cause during his or her first two years on the job, which is considered a probationary period for new hires. This measure reduces the probationary period to a single year. The backstory: There are about 150 deputy city attorneys in San Diego, and they lack job protections typical of other civil servants. 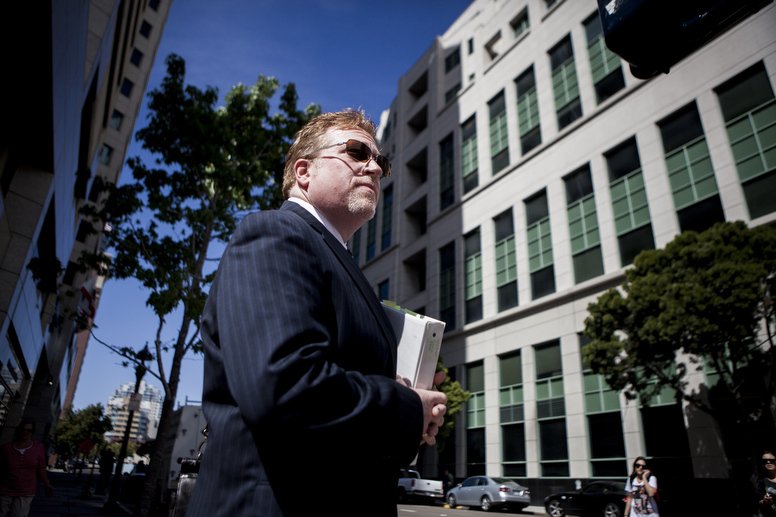 A decade ago, there was huge turnover in the city attorney’s office. This became a campaign issue in 2008, when current City Attorney Jan Goldsmith won. With Goldsmith’s blessing, voters approved 2010’s Proposition B, which gave deputy city attorneys more job protections. They can still be fired without cause in their first two years on the job but can only be fired for “good cause” after two years. Goldsmith also supports Measure F, which is backed by the Deputy City Attorneys Association, which wants to protect its newest members from being fired for political reasons, particularly with the election right around the corner. Now, supporters of Measure F say two years is too long of a probationary period. They include the deputy city attorneys union, the San Diego Taxpayers Association, the League of Women Voters of San Diego and City Council President Sherri Lightner. “This measure makes it harder for politics to influence the office and its makeup,” they said in a joint statement. Mara Elliott, a candidate for city attorney who is the current chief deputy city attorney, also supports the measure. She said it’s pretty easy to tell if a new hire will be a good employee. No one has filed an argument against the measure, nor did anyone speak directly against it during recent City Council meetings. Councilmember Todd Gloria voted against putting the measure on the ballot, though. He isconcerned about ballot printing costs and did not think Measure F was urgent. A YES vote would: extend job protections to deputy city attorneys after their first year on the job. A NO vote would: continue to give deputy city attorneys job protections only after two years on the job. What it is: Measure G would make some minor tweaks to the portion of the city charter that deals with the Citizens’ Review Board on Police Practices, the 23-member volunteer panel that reviews the police department’s Internal Affairs investigations. The backstory: For years, civil rights groups have argued that the CRB lacks teeth, since its role is to review — and not independently investigate — the San Diego Police Department’s own investigations. 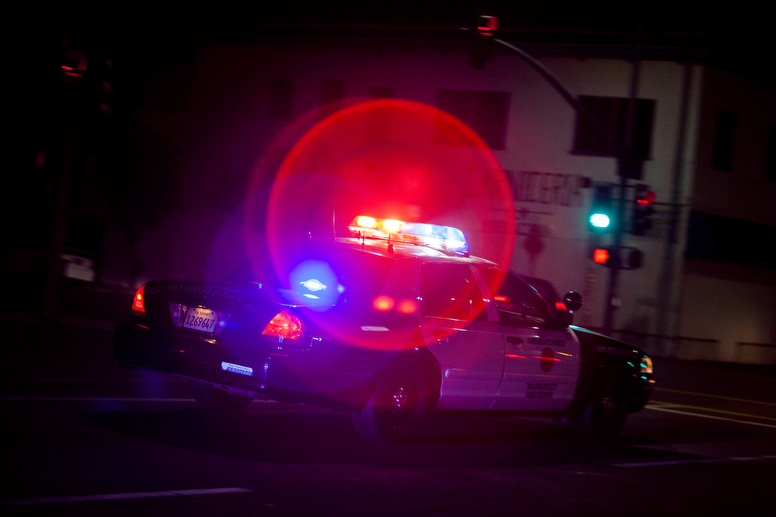 Earlier this year, a group led by Women Occupy San Diego called for an overhaul that would make the CRB more like the county’s Citizens’ Law Enforcement Review Board, which has subpoena power, conducts its own investigations of complaints against the sheriff’s deputies and probation officers and publishes summaries of those investigations. The county board also has the ability to hire outside legal counsel while the CRB relies on the city attorney’s office for advice, raising questions about conflict of interest. Some of the recommended changes — outside legal counsel and investigative summaries — don’t require a public vote and are in the works. Other changes, like how CRB members are selected, are spelled out in the city charter and require a vote. A YES vote would: change the CRB’s name to the Community Review Board on Police Practices, enshrine in the city charter the CRB’s authority to investigate deaths at the hands of police and make it easier for the City Council to regulate how the CRB operates. Currently the mayor has sole authority over the CRB and who sits on the board. A NO vote would: keep things the way they are. What it does: This uncontroversial measure resolves a concern of city staff about the City Charter. “The amendments would require contracts for public works, goods, services, and consultants to be awarded through a competitive process, in accordance with rules adopted by the City Council by ordinance.” It also, though, removes a requirement that the city advertise certain contracts in a local newspaper 10 days before the deadline for bids. The change would allow the city to simply follow public disclosure rules that already exist. The backstory: City staff requested the change. Like many uncontroversial changes to the City Charter, it was put on the ballot by the Charter Review Committee and City Council. Nobody is on record opposing it. A YES vote would: approve the change. A NO vote would: reject it. What it is: Measure I would allow the City Council to extend San Diego High School’s lease on its current location at the edge of Balboa Park. The backstory: The city charter and state law say schools aren’t allowed on city parkland. But San Diego High, the city’s oldest high school, was built years before the city charter was drafted and decades before the state law was written. In 1974, negotiations between the city and school district resulted in a 50-year lease. City Council President Sherri Lightner, the only Council member to oppose sending the measure to ballot, told KPBS the intent of that lease was to give the San Diego Unified School District 50 years to come up with a new location for the school. Councilman David Alvarez, who graduated from San Diego High and supports the measure, said there isn’t sufficient space downtown to build a new high school that could serve the families in his district. “The honest truth is that if the school district were going to build another school, they needed to get to work on that a long time ago (when there was still land available),” Alvarez told KPBS. Alvarez said he’s concerned that a forced relocation would disrupt learning and create instability at San Diego High. The plan has support from Alvarez, Councilman Todd Gloria, San Diego Unified Superintendent Cindy Marten and school board vice president Richard Barrera. Lightner, the retired chief deputy city attorney who handled the half-century lease issues in 1974 and park conservationists oppose the measure. 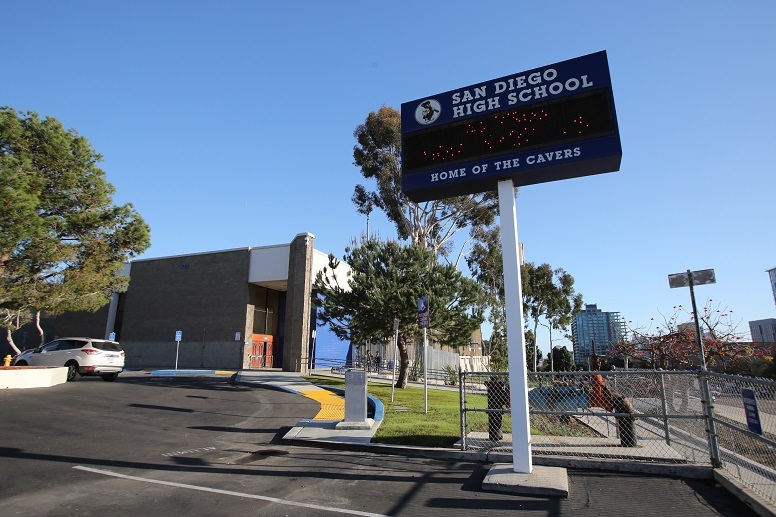 A YES vote would: amend the city charter and authorize the City Council to extend San Diego High’s lease on the parkland where it currently resides. A NO vote would: mean San Diego High must relocate after 2024. What it is: Measure J would direct money from Mission Bay Park’s commercial leases to regional parks, including Mission Bay Park, Balboa Park and others. The measure, introduced by Mayor Kevin Faulconer, would also give the city flexibility to more quickly pursue certain repair projects in Mission Bay Park and allow the city to seek a $126 million bond for regional parks. 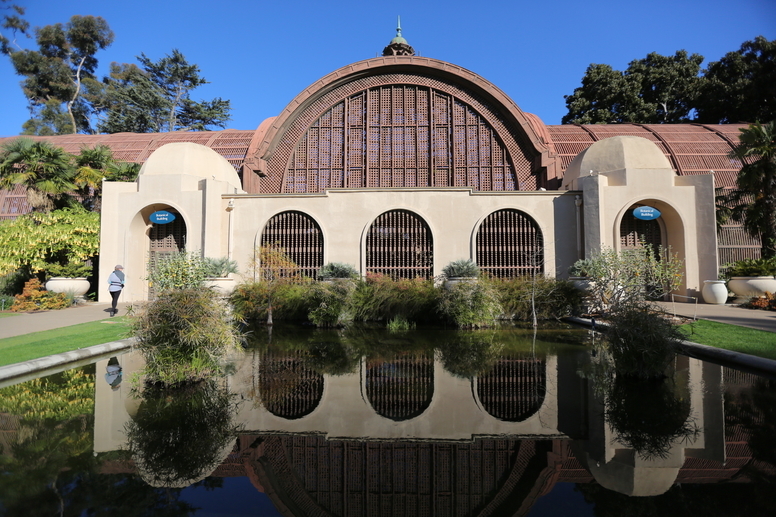 Though the measure would require nearly two-thirds of the bond be funneled to Mission Bay, the mayor’s office has said repairs for Balboa Park’s historic buildings would be prioritized. The backstory: In 2008, voters approved Proposition C, which requires that 25 percent of Mission Bay lease revenues over $20 million support regional park projects. The majority of the money has gone to Mission Bay Park. But Balboa Park and other regional parks also have many needs, and lack cash to pay for them. This measure would bring more money to those parks while still allocating 65 percent of lease revenues to Mission Bay Park. A YES vote would: throw more Mission Bay lease revenue – and likely, bond money – at regional parks other than Mission Bay and maintain a revenue stream for all regional parks through 2069. A NO vote would: keep things the way they are, with Mission Bay Park receiving a steady stream of money, and regional parks receiving less. Mission Bay’s arrangement would end in 2039 with a no vote. 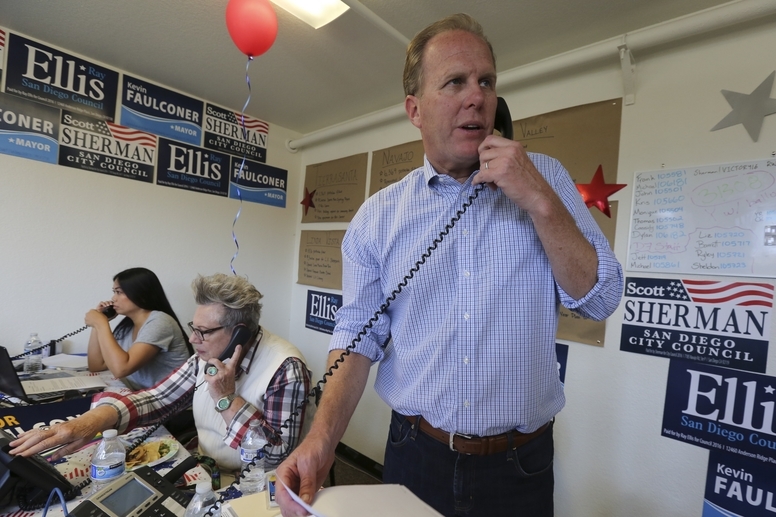 San Diego Mayor Kevin Faulconer makes some last-minute calls on Election Day, June 2016. Faulconer won enough votes to forgo a November runoff. What it is: Measure K would require that the two candidates who get the most votes in a June primary election for City Council, mayor or city attorney face each other during the November general election. Currently, if a candidate in the June primary gets more than 50 percent of the vote, she wins the office outright. This would ensure the top two vote-getters face off in November, no matter what. The backstory: Liberal leaders last year said the city should change its law that let candidates win during June primary elections if they win more than 50 percent of the vote. In recent years, Republicans had won races in June, depriving Democrats of a chance to take them on in November when increased voter turnout increased their chances of success. Plus, they argued: Doesn’t it make more sense to make city decisions the same way we make state decisions, and when more voters show up to have a say? In 2012, 1.2 million San Diego County voters participated in the November election; earlier that year, 548,000 San Diego County voters showed up for the June primary. This summer two independent groups asked the City Council to put the issue on the November ballot. The Council agreed, with all five Democrats voting to put the issue on ballot and all four Republicans voting against it. A YES vote would: require that the top two finishers in a June primary election advance to a runoff in the November general election. A NO vote would: maintain the current system, where a candidate can win an election in June if he or she gets one vote beyond the 50 percent threshold. 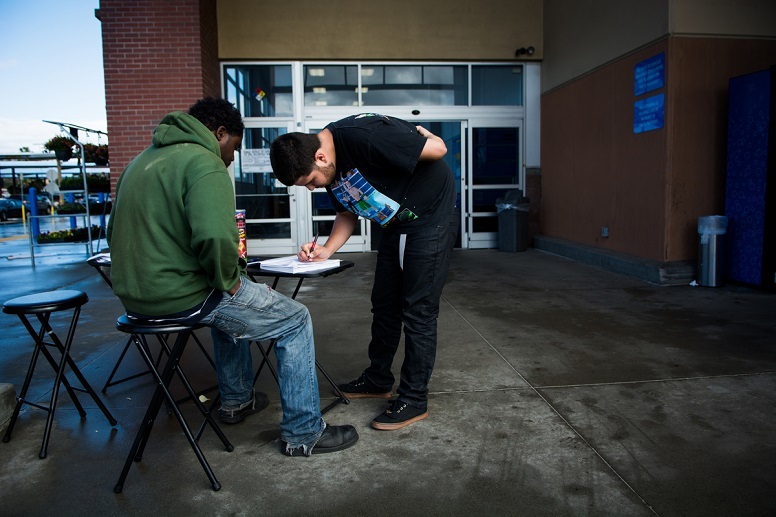 A customer leaving the Walmart on Clairemont Mesa Boulevard signs a petition opposing the One Paseo development. What it is: Currently, when citizens collect enough signatures to put an issue to the voters, or to ask voters to overturn a previous City Council decision, that item goes on the ballot for the next election, whether it’s in June or November. This would make those initiatives automatically appear on the November ballot, unless the City Council intervenes and votes to put them on the June ballot instead. The backstory: This is in many ways a companion item to Measure K, and comes with the same basic argument: It’s better to make major decisions when more people vote than when fewer people vote. And like that measure, the practical effect of the change would benefit local Democratic causes, if recent history is any guide. For instance, conservatives qualified pension reform for the June ballot in 2012 and won with the help of a right-leaning electorate. Two years later, business groups collected signatures hoping to overturn a decision made by Democrats on the City Council to pass new development restrictions in Barrio Logan. It also won in June, with a right-leaning electorate. This measure would ostensibly put both of those items on the November ballot instead, where they might have fared better with a larger, more liberal turnout. A YES vote would: send all citizens’ initiatives and referendums to November elections, unless the City Council votes to send them to a June election instead. A NO vote would: leave things as they are, with citizens’ initiatives and referendums on the ballot for the next closest election, whether June or November. The San Diego Housing Commission is fixing up the Hotel Churchill building to house low-income residents. What it is: State law requires that voters approve any rent-controlled homes that are developed, built or acquired by a public agency. This measure would give the city permission to do so for an additional 38,680 homes reserved for low-income people. It wouldn’t spend any money on any low-income homes or approve any specific projects – it would just pre-emptively give the city permission to make way for that many additional rent-controlled homes. The backstory: In 2002, voters gave the city permission to build, develop or acquire up to 10,500 homes for low-income people. The city is now about 3,000 homes away from reaching that limit, so it is again asking voters to lift the cap on the number of rent-controlled homes it can provide. But instead of lifting the cap by just 5,000 homes, as it did 14 years ago, the city is now asking voters to dramatically increase its capacity to provide low-income housing. The measure would let the city build up to 49,180 total homes reserved for people earning below the area’s median income. The city didn’t pluck that number from thin air. It comes from a regional assessment of the number of homes for low-income people the city is going to need by 2020. That assessment said the city needs 38,680 such homes, so the city simply added that number to the existing limit to reach the otherwise-odd total of 49,180 units. A YES vote would: increase the number of rent-controlled homes the city is allowed to build, develop or acquire. A NO vote would: maintain the current limit on the number of rent-controlled homes the city is allowed to provide. What it is: If California voters approve Proposition 64, which would make it legal for adults to use marijuana, this citywide measure would impose a sales tax on businesses that sell marijuana for recreational use. The tax would begin at 5 percent and increase to 8 percent in 2019 – the City Council would then be able to adjust the tax in future years, but it could never go above 15 percent. The revenue would go into the city’s general fund. The backstory: Councilman Mark Kersey proposed the measure this summer, arguing California’s potential legalization of marijuana would require increased city spending on things like code enforcement and public safety. The state measure would levy its own 15 percent sales tax on marijuana, but Kersey said the city needed to make sure a local tax would take care of local expenses related to regulating the drug. Industry advocates, however, warned against setting the rate too high, which could make it harder for legitimate businesses that go through the city’s permitting process to compete with black-market sellers. The city’s independent budget analyst estimates a 5 percent tax could raise around $22 million a year, based on Denver’s experience since it started selling recreational marijuana. But that number is dependent on unknowable variables, like how easy the city makes it to open a recreational marijuana dispensary, the price of recreational marijuana and its availability in neighboring cities. The city’s budget analyst also anticipates that the city could spend about $650,000 a year on new administrative positions related to the tax increase. 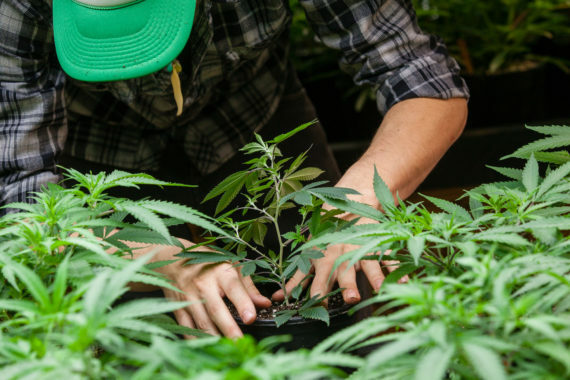 A YES vote would: impose a new sales tax on recreational cannabis businesses, ranging from 5 percent to 15 percent depending on future City Council actions – but only if voters approve a statewide proposition legalizing marijuana in the first place. A NO vote would: reject a new sales tax on recreational marijuana businesses. Kelly Davis contributed to this guide.